I recently had a “cooking camp” with my 8 year old nephew, 6 year old niece, and 5 year old son, where we made Vietnamese Salad Rolls for a finger-food-Friday dinner. 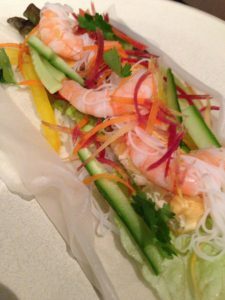 The kids peeled shrimp, learned how to pan-fry firm tofu, chopped peppers, shredded carrots and cucumber, as well as cooked rice noodles. 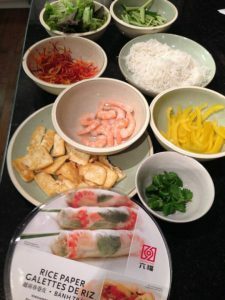 One of the highlights was providing them the the general ingredients to make the peanut dipping sauce, but empowering them to decide as the chefs what extra ingredients to add to make it just right. Once the bowls of fresh ingredients were ready, they softened the rice wrappers in hot water and assembled their salad rolls. The cooking camp was messy and chaotic, but that is half the fun! As a parent, caregiver, or cool aunt or uncle, one of the best gifts you can give kids of all ages from preschool to the teenage years, is to simply cook with them. Not only is it fun, but also provides them with a key life skill that they need to know. Instead of simply just baking cookies or cupcakes with kids, teach them how to make an entire meal or something new and healthy they haven’t tried before. Picky eaters are more invested in trying something if they are involved in preparing it. Success with kids is more about creating fun, exposure, and sampling than having them eat a bunch of the new food or even like it. What are some of your favourite meals to cook with kids? Let us know in the comments below!